Date: Sept. 23 at 7 p.m.
Christina Morrisett, left, and Melissa Muradian collect water samples in Box Canyon. The samples will be tested in the HFF lab or sent to a specialized lab for more in-depth study. 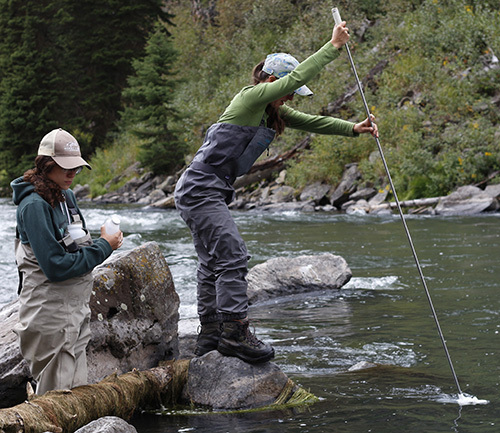 It's all part of the Foundation's ongoing water-quality monitoring program. Our second year of water-quality monitoring showed that suspended “sediment” transported out of Island Park Reservoir largely reflects reservoir management. “Sediment” appears in quotes because additional data collection we did this summer showed that at least one-half of suspended material downstream of Island Park Dam is organic matter, not mineral sediment. This organic matter contributes to the aquatic food web downstream, including trout growth. With the organic matter included, total load of suspended material delivered to the river at Island Park Dam was 1,247 tons during the summer, compared with 931 tons in 2014, reflecting higher irrigation deliveries and lower reservoir drawdown this year. These suspended “sediment” loads are around 1 percent of the total load delivered into the river during the complete drawdown of the reservoir in the fall of 1992. As the water year comes to a close, delivery from Island Park Dam has been reduced to begin storing water for next year. Island Park Reservoir reached a minimum volume of 38,621 acre-feet (28.6 percent of capacity) on Sept. 9. Although the 2014-2015 water year was the sixth driest on record—and the driest since 1941—May rains and an early irrigation season prevented even further draft of the reservoir. In 2013, Island Park Reservoir reached a minimum of 35,023 acre-feet (25.9 percent of capacity) on Sept. 23. So, despite an extremely dry year, we are already two weeks and 3,598 acre-feet ahead of 2013 in terms of reservoir storage. More details can be found in our HFF blogs. The Henry's Fork Watershed Council will meet Tuesday, Oct. 13, at the SpringHill Marriott in Rexburg, Idaho. The meeting agenda is still tentative and will be distributed to participants as soon as it is finalized. Anyone who plans to attend is asked to RSVP by Oct. 9 by emailing cathy@henrysfork.org or calling (208) 652-3567. The November HFWC meeting will be the organization's annual water conference and will also be held at the SpringHill Marriott. Presentations are expected to focus on year-end summaries from participating agencies. Read about the annual field trip in August 2015 and view the tour photo album. 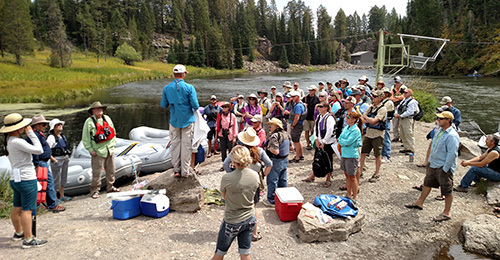 ​HFF and the Teton Regional Land Trust hosted a river float on the Henry's Fork the end of August to explain land and water conservation issues and programs to interested members. More than 65 people took advantage of the scenic float and a reception afterward at the TroutHunter.